Ms Rekha Sethi is the Director General of the All India Management Association (AIMA), the apex body for management in India. AIMA is a non-lobbying organization, working closely with Industry, Government, Academia and students to further the cause of the management profession in India. AIMA makes a salutary contribution to management learning and practice in the country by offering various services in the areas of testing, distance education, research, publications and management development programmes. 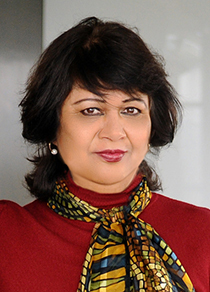 Rekha took charge of AIMA in June 2008. She has since established AIMA as the preferred platform for discussions and debate on management and has deepened AIMA's relationship with the Government of India and India Inc. AIMA now attracts India's top industry leaders and policy makers on its platform. Rekha is also on the Boards of some leading Indian companies as an Independent Director including Sun Pharmaceutical Industries, the world's fifth largest specialty generic pharmaceutical company and India's top pharmaceutical company. She is also on the Board of Sun Pharma Laboratories Ltd.
Rekha is an Independent Director on the Board of CESC, one of India's leading Power generation and distribution companies and the flagship company in the RP-Sanjiv Goenka Group. She is also on the Board of Spencer’s Retail Ltd. She is also an Independent Director on the Board of Hero Steels Limited, which manufactures steel sheets and products. She is part of the Executive Council of the National Board of Accreditation, which is mandated to facilitate quality in technical education syllabi in India and a member of the Advisory Board of the Switzerland based St Gallen Foundation think tank, Leaders of Tomorrow – Knowledge Pool. Prior to joining AIMA, Rekha worked with India's premier industry organization, the Confederation of Indian Industry (CII) for over 17 years. There she led the initiative to create high-profile international events to promote India's economic interests.